Cultural Front: Black Nerd Style: Who Started It? Black Nerd Style: Who Started It? 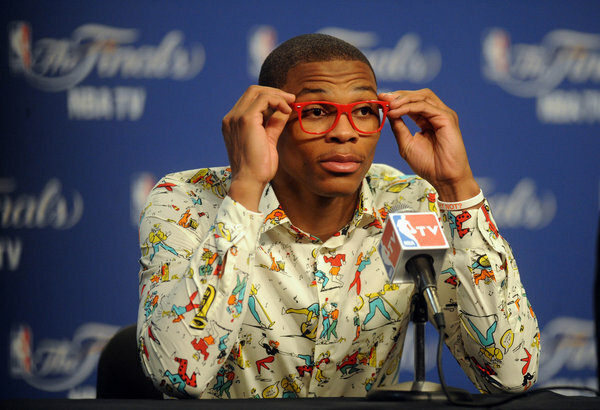 When Russell Westbrook claimed that he had been wearing glasses without lenses since he entered the league, LeBron was quick to explain that Westbrook “absolutely didn’t start” the fashion trend. A strange fight ensued between Westbrook, LeBron, and D-Wade, as each man claimed originality for the idea of fake glasses. In the ensuing debate, the players and media called attention to the NBA’s black nerd style and the transformation of the league. The transition in appearance, spurred by David Stern’s dress code policy, follows the evolving hip-hop aesthetics of the day. While it is strange that NBA superstars are deliberately choosing to look like Steve Urkel, it is more interesting to acknowledge how mainstream black culture has embraced a trend that is traditionally considered ‘white.’ There is a double-consciousness exemplified in the players’ attire, and it is noteworthy even if unintentional. The cardigans, three-piece suits, bow-ties, and even Westbrook’s eclectic shirt (shown above) seem more appropriate for a white, upper-middle class business man, and it is reflective of the growing pressure for NBA players to present themselves as clean-cut and well-mannered. On the other hand, the fake glasses trend is an indicator of how NBA players are continuing the African American tradition of innovation and self-expression. Even as Durant wears a backpack to press conferences and maintains his good-boy image, even as Westbrook jokes about his Steve Urkel outfit, the black nerd style represents a creativity in black culture that is largely ignored.